The week of May 19th through the 25th is national safe boating week. As we prepare for the upcoming boating season, bringing awareness to boater safety on the Fox River is necessary. As officers begin to patrol the Fox River, we often see boaters violating the navigational and speed violations set forth. We want to see boaters enjoying the waterways of our community, while ensuring that those around us are safe in the process. Most importantly this week is designed to bring awareness to boating regulations and the importance of wearing your life jacket. With the anticipation of national safe boating week, May 18th is "wear your life jacket to work day." 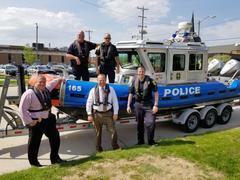 Officers of the Green Bay Police Marine Unit took some time to support this campaign and want to do our part in creating awareness to the importance of wearing your life jacket. Boating fatalities can be prevented by simply putting on your life jacket. We also want to stress the dangers of “boating under the influence” and do whatever we can now to prevent these incidents from occurring. Boat crashes and BUI can have tragic results. With Memorial Day being the kick off to the boating season, it is important to have these conversations now, with the hopes of preventing unnecessary tragedies. 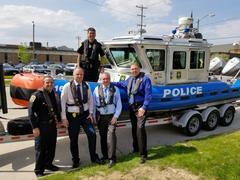 The GBPD Marine Unit encourages all boaters to have a safe and enjoyable boating season. We encourage you to attend the US Coast Guard Open house on Saturday from 11 AM to 4 PM. 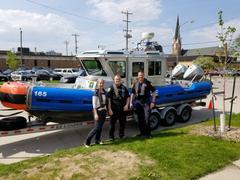 Residents can see the GBPD vessel that patrols the waterways, and meet the USCG staff who oversee the river and bay of Green Bay. We look forward to a safe and enjoyable boating season.